The Secret Life of Shoes: MC Hammer and Hammer Pants! MC Hammer and Hammer Pants! Hammer had to sell his catalogue of music. I hate that for him. I wish that was not the case. Someone else "can touch this!" Hammer messed up but good. MC Hammer's back catalog has been sold for almost $3 million, according to reports. The collection of music, which amounts to approximately 40,000 songs, including global hits "U Can't Touch This" and "Pray," has been bought by the music company Evergreen. Evergreen described the collection, which they bought for $2.7 million, as "some of the best-selling and most popular rap songs of all time." 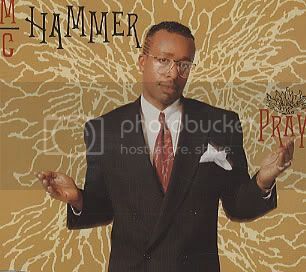 The sale of Hammer's music comes after he filed for bankruptcy in 1996, with debts in the region of $14 million. Speaking on behalf of Evergreen, David K. Schulhof commented: "We anticipate that many songs in the MC Hammer catalog will emerge as a perfect fit for licensing in movies, television shows, and corporate advertising." The sum of the acquisitions brings the company's holdings to 40,000 copyrights. The MC Hammer catalog was acquired for $2.7 million from the trustee of the MC Hammer bankruptcy case. MC Hammer, who has more recently taken on the role of minister, is apparently expected to release a new album, Look3X, in the coming months. Video clip from Look3X: click to view! On my go....1, 2, 3 all together: MC Hammer is the man! I was visiting a fellow blogger who stopped by my site and found a great blog.....Daily News, Pop Culture, Rants and News. The post that sparked my interest was Historical Blunders in Hip Hop History . Some of the things..probably most of the things on the list I would agree with. In the comments someone mentioned adding MC Hammer to the list. BIG FAT NAY on that one! They went on to add the Hammer Pants and the Chinese Typewriter. EVEN BIGGER NAY on that!!! 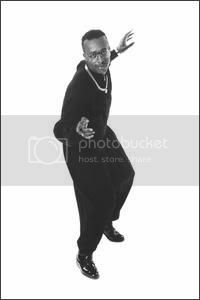 MC Hammer was the man in his hayday! I loved him. Him in his hammer pants. I loved hammer pants and had a pair of black ones that I wore until they came apart. Hammer pants were the most comfortable pants I have ever worn. I have searched the WWW for a pair now and cannot find them. Believe it or not I am not alone. I have come across others searching for hammer pants as well...there are none on EBAY. There were hammer pants for women. I even had a pair of beige knit overalls that had the hammer pants legs. I wore that thing to death as well. I will never forget the time my mother asked me to pick her up from a meeting that she and some coworkers were having after work at Applebees. I was in my hammer pants jumper. I looked good and noone could tell me I did not. I walked into the place to get mom and all was fine until I got to the car with her. She lit into me like white on rice about my hammer pants. She said it was a clown suit and she was embarrassed. I was wearing it so how could she be embarrassed? That did not stop me! I continued to wear my hammer pants. I have pictures of me in the black ones in a photo album I cannot put my hands on right now. Hammer created a dance called the chinese typewriter and I could do that just as well as he could. I was in love with Hammer. He was the first rapper with no curse words and he stood by that..His language in songs were not suggestive either. He was a clean rapper and his music was very danceable. In our mall one of the local radio stations had DJ's out doing a contest for best lipsync to a song. I was working in the mall at the time at the Estee Lauder counter and I got 3 counter mates from Lauder and 1 from FashionFare to do Can't Touch This. They made a videotape of all the entries. It was a mall full of people. I was the lead and sang with my coworkers as back up. In the middle I had to hike up my Estee Lauder uniform skirt so that I could do the Chinese typewriter. The crowd went crazy!!!! We got our tape...we won...we were featured on the local 6pm news, the 11pm news, the morning news the next day, the news at noon and the 6pm news again. MC Hammer, Hammer Pants and the Chinese Typewriter will always be dear to me! I still have the video tape!!!!!! Trust me, everyone I know has seen that tape...I make sure of it! So far that has been my only 15 minutes of fame. I even have the MC Hammer doll that was put out about the same time. Man is that doll cool. Hammer is in his gold hammer pants, fade and has a mike. After all he is the "MC." I still have his music and listen to Can't Touch This at least once a week. When I lose the cd or it gets a scratch I go out and buy another. Hammer is still the man! You know you love Hammer too but are just afraid to admit it! (LOL) Be brave, get the courage to say "Can't Touch This!" and wear your hammer pants. Even thought I cannot find a pair on line, mentally I have on my hammer pants EVERY single DAY! There had been hit rap singles and albums before him, but MC Hammer was the man who truly brought rap music to a mass pop audience. Armed with a flamboyant wardrobe (particularly his trademark baggy parachute pants) and a raft of sampled hooks lifted straight from their sources, Hammer's talents as a dancer and showman far exceeded his technique as an MC. Still, he had an ear for catchy source material, and that helped his second album, Please Hammer Don't Hurt 'Em, become the best-selling rap album of all time. Even if he was never able to duplicate that level of success, and even if his street credibility was virtually non-existent, Hammer still broke down numerous doors for rap music in the mainstream, demonstrating that hip-hop had the potential for blockbuster success in the marketplace. 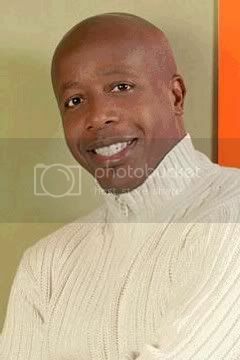 MC Hammer was born Stanley Kirk Burrell in Oakland, CA, on March 30, 1962. A member of a strongly religious family, he landed a job as a bat/ball boy for the Oakland Athletics baseball team, where he entertained fans by dancing during breaks in the game, and earned the nickname "Hammer" for his resemblance to all-time home run leader "Hammerin'" Hank Aaron. An aspiring ballplayer himself, he failed to catch on with a professional organization following high school, and enlisted in the Navy for three years. Long a fan of funk and soul, he became interested in hip-hop upon returning to civilian life, and began performing in local clubs; with the financial help of several Athletics players, he also started his own record label, Bust It, and recorded a couple of popular local singles. With ex-Con Funk Shun mastermind Felton Pilate producing, Hammer recorded an album titled Feel My Power in 1987. After impressing a Capitol Records executive with his already elaborate live show, he was signed to a multi-album deal, the first of which was a revamped version of Feel My Power retitled Let's Get It Started. Producing an R&B hit in "Turn This Mutha Out," Let's Get It Started went double platinum. Still, nothing could have foreshadowed the phenomenon of Please Hammer Don't Hurt 'Em, the 1990-released follow-up. Its first single, "U Can't Touch This," blatantly copped most of its hooks from Rick James' funk classic "Super Freak," yet Hammer's added catch phrases (and young listeners' unfamiliarity with the original song) helped make it a smash. "U Can't Touch This" dominated radio and MTV during 1990 in a way few rap singles ever had, and won two Grammys (Best R&B Song, Best Solo Rap Performance); save for a quirk in its release format -- it was only available as a 12", which cut down on its sales -- it would easily have been the first rap single to top the Billboard pop chart. The next two singles, "Have You Seen Her" (a flat-out cover of the Chi-Lites' '70s soul ballad) and "Pray" (built on the keyboard hook from Prince's "When Doves Cry"), followed "U Can't Touch This" into the Top Ten, eventually pushing sales of Please Hammer Don't Hurt 'Em past the ten-million mark and making it the number one album of the year. Still, a backlash was growing against Hammer's frequent borrowing (some said theft) of classic hooks for his own hits; hip-hop purists also railed about his often simplistic, repetitive lyrics (indeed, "Pray" set a new record for the number of times its title was repeated during the song, at well over 100). The charges of rank commercialism weren't lessened by the merchandising machine that soon kicked in: endorsement deals, MC Hammer dolls, even a Saturday morning cartoon show. sewing/craft store if you are in America. Simplicty pattern 4788.
the name of the film your talking about is "Please Hammer Don't Hurt'em"
Hammer turned my life around in the '90s. I was a shy guy back then in secondary school, until our school wanted us to do a mime (lip synch) show. I chose to do Hammer, and everyone laughed. I went home for a week, watched all his videos, came back talking, walking, looking like him (hairstyle, outfits and all). I got together 11 guys and we trained for days. On the night of the show, something happened... When I made my entry into that hall right after my boys to the boom of "let's get it started... let's get it started... let's get it started..." I changed forever. I was so powerful, I felt like HIM. We had the whole community screaming for almost an hour, I became a hit just for being like him! I'm sure a lot of the person I am today has had to do with the social lessons I learned in the reign of "the Hammer". I was his biggest fan in Nigeria no doubt, and was called by that name in school and all. Hope to meet u someday wherever u are Hammerman. I really wish things happened differently for him, because i still don't see any spell-binding dancers come along since HE. Hammer kept you on your feet screaming non-stop at his footwork. Don't let us down man... we love ya!